This “Serious Game,” developed by Tucker Marion, Sebastian Fixson, Harvard Business School Publishing, and Forio, has won gold honors in the 2018 International Serious Play Awards competition in the Education Corporate category. 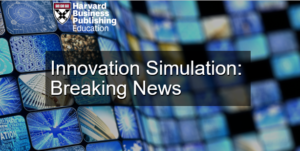 “Innovation Simulation: Breaking News” is a 20-30 minute simulation in which students are required to manage the innovation process for The Citizen Sun, a newspaper company struggling in the digital age. In recognition of the awarded gold honors, Eliane Alhadeff discusses how the simulation provides students an experiential opportunity to navigate various modes of innovation available to The Citizen Sun in her article Harvard Business Publishing Serious Game for Managing Innovation. “Aimed at undergraduate, graduate, or professional students studying innovation,” Alhadeff writes, “the ‘Serious Game’ teaches students about the challenges of innovation management, the tradeoffs, between different types of innovation, the role of organizational context in innovation, and the potential of open innovation.” It is a small sampling of the many nuances that plague innovation, and it brings to life a number of the same topics Marion and Fixson dissect in The Innovation Navigator, due for release in October.